On December 23, 2017, an environmental inspection team sent by the central government publicly criticized the Hainan provincial government’s obsession with developing real estate and other projects that come at a huge cost to the local ecosystem. On December 23, 2017, an environmental inspection team sent by the central government publicly criticized the Hainan provincial government’s obsession with developing real estate and other projects that come at a huge cost to the local ecosystem. The team’s report said over-developed property projects had severely damaged plant life and wildlife and criticized excessive land reclamation and improper sewage dumping. Demand for luxury apartments in the province rose rapidly after the State Council vowed in 2010 to transform it into a high-end tourism zone. 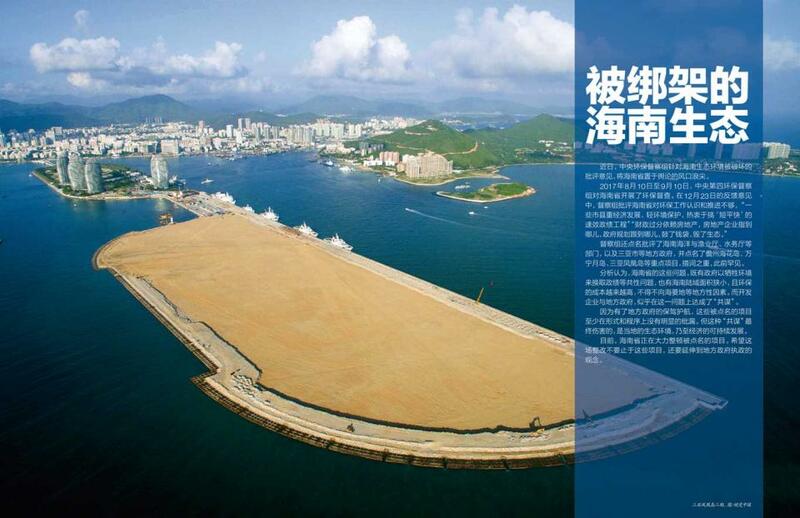 Projects such as Ocean Flower Island, a tourist resort with hotels, shopping malls, and residential buildings valued at around 160 billion yuan (US$24b), were found to have been illegally approved by the local government without an environmental impact assessment. Eight of Hainan’s 10 national-level nature reserves, including tourist projects, were not officially approved. To date, 295 officials in the province have been held accountable, with 49 detained over the environmental damage caused by projects they were overseeing. Collusion between local authorities and businesses has damaged the local environment and the prospect of sustainable economic growth.